We had a near tragedy this past week when the platform two window washers were working on gave way on the 37th floor. Luckily they were rescued by the Boston Fire Dept. This window washer is only on the third floor; he told me he has never gone higher than the 24th floor. The only way I would get that high in a building is in an elevator. Never higher than the 24th? What's the difference between the 4th and 24th? A few seconds. But I think the outcome of a fall is the same. Glad the window washers were safe. Takes a lot guts for that job, IMO. BTW, great skywatch photo. I'm not fond of heights so this looks scary. I was in Post office square a few hours after that incident. The window that the Boston Fire Department knocked out to rescue them were still missing. And of course the news crews were still there. Glad that nobody was hurt and once again the BFD saved the day. Great sky shot - sky, reflection of sky, and worker in the sky! Looks like he's inching his way up that building. I agree...I'll stick to the elevator! Glad nobody was hurt.I'll choose the lift, too. but your picture is so impressive, with that angle, that flying away perspective, and all the clouds reflections..Great shot! No-way Jose, I get dreadful vertigo although I spent years flying in the RAF. Can't stand being near an open 'edge'. Like the strong shapes, the sky reflection and the red on the guy. It's a great photo! Well I have no problems with vertigo, so it doesn't look scary for me. What's the difference between 24th and 25th floor by the way? This is a really wonderful photograph, rich with symbolism. You invite the viewer in to interpret it so eloquently. Fantastic shot. These people are incredible. So brave. Wow! Isn't it exciting to end up being a roving reporter/journalist while out taking photo for blogs. So glad that this incident turned out the way it did. And, my, what an amazing picture you've got. It deserves to win a prize somewhere! I've seen some modern buildings that utilize mechanical washing systems. I'm surprised more buildings don't use them. That is a great shot! You wouldn't catch me doing that even on the 2nd floor. I like the reflections. The photography is truly spectacular. oh I love this shot!! wonderful! Thankfully there is more than one lift in this kind of building. Good thing those guys got rescued, it must have been a scary day for them. The photo is striking. Very scary. Rather him than me, but it does make a great photo. Eek. I'm glad that it didn't turn into a real tragedy. Scary job. Fantastic photo though! Love the angle, the reflections, the wonderful sky and the bright spot of red. My goodness, what a story. I'm so glad the outcome was a good one. And a very nice shot too. I agree with you. Excellent shot. 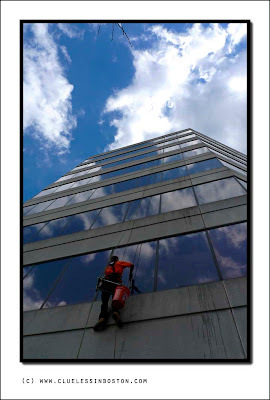 This is a job I do not envy...even though I'm sure the window washer's view is usually amazing. Great photos on your blog space, really enjoyed reading through all the blog posts. Lived in Boston for many years and have many fond memories of the area. Thanks for sharing with us all and adding to the party of Sky Watch Friday.